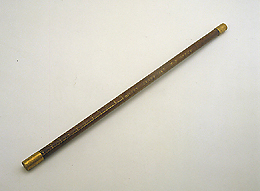 This instrument is used to carry out topographical measurements and measurements of elevation. The instrument is made of wood, with decorations in gilded brass. It probably belonged to the collection of mining instruments brought from Germany by Prince Mattias de' Medici in 1635, which joined the collection of instruments conserved in the Florentine Gallery of the Uffizi.